Do you have strong negotiating skills? If you've done much exploring of this site or are a subscriber to my newsletter, you know I advise people to PREPARE before going to a job interview. In this article, guest author Matthew Keegan offers tips on preparing for one of the toughest challenges... negotiating skills and how they affect your salary! Salary negotiation is an important topic that must be addressed prior to your initial interview with a prospective employer. Knowing your bottom rate, and being able to live with it [or on it?] 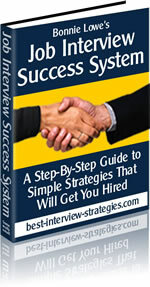 is an important thing for candidates to uncover before the first interview. Why then do so many of us make the tactical mistake and go to the interview unprepared? One of the first mistakes - a real killer - is to tip your hand too early in the interview process on what you will accept for a salary. Many interviewers will attempt to screen you out by finding out what your ballpark figure is. To mention that amount too early in the interview process can and will lock you in to a figure you might not be happy with later. Try changing your salary requirements after an offer has been made and you will come across looking flaky or greedy. You must have a salary range in mind before going on the first interview… you then have to be determined not to reveal it in that interview or you just might find yourself on the outside looking in. In other words, you will be screened out of the selection process before you can show the employer [the person with hiring authority, not the Human Resources (HR) rep.] what you can do for them. If you are asked on the first interview what your salary requirements are you must stall the interviewer. Chances are the first interview is with an HR rep who is trained to weed people out, oftentimes the salary requirement being one of the "weeds" the rep looks at to eliminate candidates. More than likely the rep is a "no-nothing" regarding your job; he or she is tasked with presenting a certain group of candidates to the person with actual hiring authority [e.g., chief flight attendant, chief pilot, operations manager, etc.] and knows [or cares] little about your background or what you can do for the company. I have seen the best candidates get screened out prematurely because they tipped their hand too early in the interview process. So, what do you do if someone insists on a salary figure? The best answer can be summed up along these lines: "my salary requirements are based on the nature and scope of the position." In other words, the more difficult the job, the higher your salary requirements will be. If pressed further - assuming the rep insists on uncovering your salary range - you can always announce a figure closer to your bottom rate. Negotiating skills may come into play far earlier on than you expect. For example, if you want 60K and sense that announcing that figure ahead of time will sink you, you can tell them: "my range starts in the upper 40s to mid 50s." That way, you won't be screened out for what the H.R. rep might consider an excessive salary requirement. Most importantly, it will enable you to go to the all important second interview with the person who has real hiring authority. Your second interview is your opportunity to "WOW" your potential employer. Tell them all the things you can and will do for them. Avoid salary negotiating and let them know they can't live without you. Once you sell them on that point, you will be prepared to give your salary figure of 60K, but only discuss salary if they bring it up [your third interview should be their actual offer to you, however be prepared for an offer earlier than that if you WOW them and they insist on hiring you on the spot. In that case you should be able to secure your upper figure]. Should the remark be made that HR told them you would accept a much lower salary, you must stress that the job responsibilities detailed to you in the interview are much greater than what the HR rep had indicated. Most reasonable people will understand that HR only has a general, not a specific understanding of the job requirements, and will accept this reasoning. Use your negotiating skills. Reemphasize your experience, your business acumen, all the points that set you apart from the average candidate, which you are not. I cannot tell you how often I have heard candidates fail at this important game, which it is - a cat and mouse game. Do not for a minute think that you will be able to renegotiate your salary later. If you settle for less you will have to live on less. Maybe that works for you, but chances are you will be unhappy and had wished you never caved in.